This was SJGR's second visit to the Beverly Free Library. Click HERE for results of our first investigation. During the course of the investigation, the presence of sensed a female presence near the fireplace in the Children’s Section. At the Librarian’s desk, one investigator smelled tobacco smoke, while another later sensed a male spirit who was in some way affiliated with the Library. On the main floor of the building, investigators also experienced a few physical sensations, including head and shoulder pain and feeling coldness of the face. In the Basement, most of the investigators sensed a strong male presence. There were multiple sighting of a tall black shadow down there as well. One investigator feels that the male may travel through the vents to the main floor as well. Another investigator also noted a female presence in the Basement. Additionally, there were reports of investigators being touched by unseen hands. Throughout the building, several investigators reported hearing the sounds of whispering, sniffling, rustling and scratching. The physical evidence collected consisted of an unusually high number of EVPs and 69 positive photos with energy orb anomalies in them. 7.6% of positive photos obtained which is just above the average range that can be obtained in any location. 9:30pm - Investigator Perley took this photo in the non-fiction section of the library. 10:21pm - Investigator Perley took this photo in the basement shortly before seeing a shadow move past Investigator Haines. 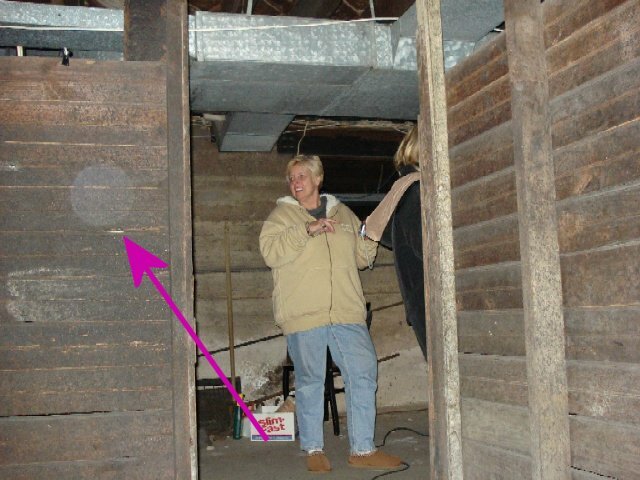 12:56am - Investigator Bown took this photo in the basement whidh is the most active area of the building.